London: Leonard Smithers, 1898. Beardsley, Aubrey. Quarto. xlv, 193pp. From a total edition of 1,100 copies, this is one of 100 deluxe copies bound in full vellum, with an extra, enlarged set of the five pictorial initials tipped-in. Out of the 24 drawings planned, Beardsley lived only long enough to complete five initials, the frontispiece, and the cover design. There are actually six pictorial initials in the text, appearing at the beginning of the Argument and each of the five acts, but the initials at the beginning of Act Two and Act Four are the same design; the enlarged reproduction of the initial appears only at the beginning of Act Two. The illustrations accompanying the initials are unusual for Beardsley in that they are shaded drawings. Only the frontispiece is a line drawing, with intricate hatching. 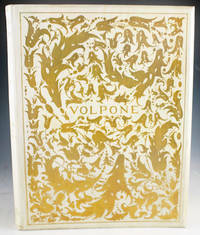 Fine in vellum boards, which are slightly bowed, with Beardsley's all-over design in gilt. (Lasner 129; Gallatin, pp. 69-70). New York: John Lane, 1898. First Beardsley Edition, copy #393 of 1000 for England and America. Frontispiece, Five Large Initial Letters and Vignettes, and cover design by Aubrey Beardsley. 1 vols. 4to. Original aquamarine cloth with elaborately gilt-stamped front cover after Beardsley's design. Fine bright copy. Bookplate of Maurice Wertheim. In open faced cloth slipcase. Beardsley, Aubrey. First Beardsley Edition, copy #393 of 1000 for England and America. Frontispiece, Five Large Initial Letters and Vignettes, and cover design by Aubrey Beardsley. 1 vols. 4to. 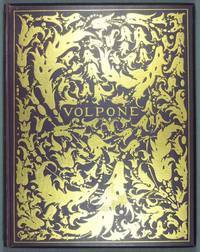 Beardsley's Volpone. One of Beardsley's consummate works, published here for the first time after his death. Ross's warm appreciation of Beardsley is an essential piece of Beardsleyana. New York: John Lane , 1898. Illustrated with 8 drawings by Beardsley who also did the upper cover gilt design which has his initials. Additional illustrations were planned, but Beardsley died before completing them. The pages are unopened. This is number 307 of 1000 copies.. Limited/Numbered. Decorative Cloth. Very Good/No Jacket. Illus. by Aubrey Beardsley. 4to - over 9¾" - 12" tall. Trade. London: Leonard Smithers. 1898. "new edition". NF, small bumps and some ep foxing; Limited ed., unnumbered 1/1000; Beardsley cover & 5 plates. .
London: Leonard Smithers and Co, 1898. Decorative Cloth. Collectible; Very Good. 1898 1st Beardsley-illustrated edition, limited to 1000 copies. Aubrey Beardsley's last work before his premature death, another beautiful collaboration of artist and text. 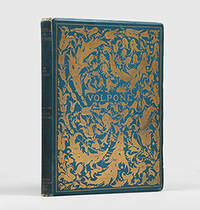 In this case he contributed the gilt-designed cover and frontispiece. 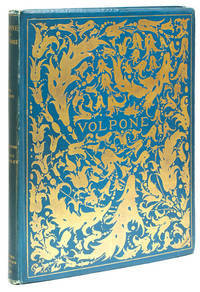 A clean, bright, VG+ copy in its original pictorial-gilt cloth. Quarto, 193 pgs. London: Leonard Smithers, 1898. One of 1000 copies on Art Paper, this copy un-numbered. Frontispiece, five initial letters, and cover design by Aubrey Beardsley. 1 vols. 4to. Original blue cloth, blocked in gilt with Beardsley designs on upper and lower covers, one corner bumped and light wear to extremities, else fine and attractive. One of 1000 copies on Art Paper, this copy un-numbered. Frontispiece, five initial letters, and cover design by Aubrey Beardsley. 1 vols. 4to. Beardsley's Last Book. Beardsley had intended a series of 24 drawings for Jonson's Venetian comedy, but died before completing it, at the age of 26. London, Leonard Smithers, 1898., 1898. First "Beardsley" edition. Thin 4to. Essay on Jonson by Vincent O'Sullivan; essay on Beardsley by Robert Ross. Frontispiece drawing, 5 vignettes and the upper cover design by Aubrey Beardsley. Original gilt stamped aquamarine cloth, upper cover with elaborate gilt stamped floral design and bevelled edges, gilt stamped vignette on back cover, with publisher's name and date stamped in gilt at bottom of spine, uncut and partly unopened (light wear to spine ends, corners slightly bumped). Very good. 195 pages. No signatures or bookplates. Number 33 of 1000 copies "printed for England and America". 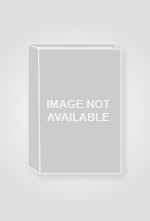 Laid in loose is a 4to proof on Japan vellum of the illustration at p. 147.. Hardcover. Very Good/No Jacket. New York: John Lane Company, 1898. Pages bright and clean except for a few small handling prints to the initial leaves, toning at the endpapers, and a touch of dust staining along the head edges; binding square and secure, full blue cloth turned inward at corners and spine ends with some small spots of fraying just starting, some light rubbing along spine sides and edges, a few faint droplet stains in the gilding on the front and light spots of surface rubbing on the rear, otherwise beautifully kept. xlv, 193pp. Numbered 211 of 1000 copies on Art Paper (an aditional 100 copies were prepared on Imperial Japanese Vellum and included an extra set of large photogravure reproductions of the frontis and capitals; Beardsley also designed the front cover and had intended to illustrate the text with additional drawings but untimely passed).. Cloth Hardcover. Very Good/No Dustjacket. Illus. by Beardsley, Aubrey. 4to. LONDON, SMITHERS, 1898. #33/1000; BEARDSLEY ILLUSTRATIONS FIRST "BEARDSLEY" EDITION VERY GOOD. 1st Edition. London: Leonard Smithers, 1898. Limited. hardcover. Beardsley, Aubrey. A New Edition, with a critical essay on the author by Vincent O'Sullivan, and a frontispiece, five initial letters and a cover design by Aubrey Beardsley. Rubricated title. 193pp. 4to, original blue cloth with ornate Beardsley design in gilt (just slightly rubbed; inner paper hinges neatly strengthened), pages uncut and unopened. Housed in a custom cloth folder and 1/2 morocco slipcase (well-worn but solid and attractive; dampstains on bottom corners). London: Leonard Smithers, 1898. First edition with these illustrations. A near fine copy in a good slipcase. Number 44 of 1000 numbered copies on Art Paper. This work includes the last illustrations produced by Beardsley before his death, a fraction of the illustrations which the artist had originally intended for this volume. London: Leonard Smithers and Co. 1898. 4to.Limited Edition. Numbered limited edition. This is copy no. 320 of an edition limited to 1,000 copies. xlv, 193 pp. 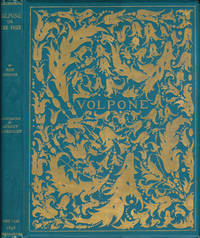 Publisher's blue-green cloth with elaborately gilt cover design by Aubrey Beardsley. Bevelled edges. Wear to spine ends and extremities. Endpapers & first leaf marked. Frontis and six vignettes by Beardsley. His final book, which includes the last illustrations Beardsley produced before his death. With a eulogy of the artist by Robert Ross. Good to VG condition. . Good. Gilt Decorated Cloth. First Edition. 1898. New York: John Lane, 1898. Published after his death. #115 of 1000. Frontispiece, Five Large Initial Letters and Vignettes. 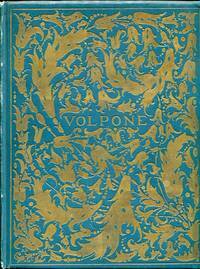 Original aquamarine cloth with elaborately gilt-stamped front cover after Beardsley's design. Spine missing 3/4 x 1/2" piece from head, tear in tail, but still present, corners bumped and rubbed, hinges starting. small puncture almost through back board. previous owners book plate on front pdep.. First Edition. Decorative Cloth. Good +/No Jacket. 4to - over 9¾" - 12" tall. John Lane, 1898. Hardcover. Good. Limited edition 188/1000. Hardcover, no dust jacket as issued. Binding good, pages clean. Illustrations by Beardsley are amazing - beautiful condition. Some foxing to endpages. Gilt illustrated cloth cover is beautiful. A nice copy of this hard-to-find title. Book condition: Very good condition. Viking, 1928. First Edition, 1st Printing. Hardcover. . Very good condition./Very good dust jacket. . B&W Illustrations by Aubrey Beardsley Not price clipped $2.00. No previous owner's marks. No underlining or marks in text. A very nice copy. New York: The Viking Press, 1928. First Edition, Third Printing. Hardcover. 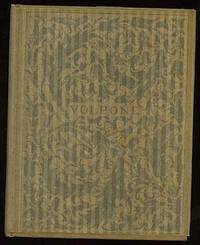 10vo, 187 pages; VG/VG-; dust jacket is in a mylar covering, has price uncut '$2.00', has minor wear along the top and bottom edges, with several small closed tears, has mild chipping at the top and bottom of the spine and on the fore edge corners, has discoloration and blotching along the spine; binding has minimal wear along the top and bottom edges; pages have dust build up along the top edge; illustrated endpapers; shelved case 0. Shelved Dupont Bookstore. 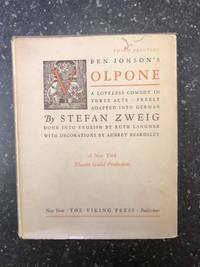 New York: Viking Press, 1928. First Thus. Hardcover. 12mo (17.75cm. 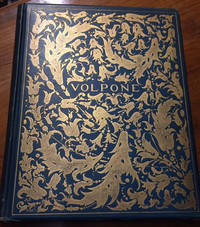 ); publisher's cloth in light tan decorative dust jacket printed in brown and orange; ,187pp. ; frontispiece and decorations throughout. Jacket extremities gently rubbed, small chip at spine crown, spine a bit toned, else Near Fine in Very Good or better jacket. "A New York Theatre Guild Production" - upper jacket panel. 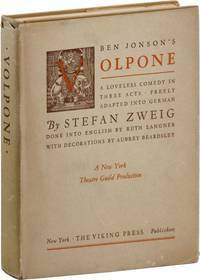 Volpone. Mit Initialen, einem Titelblatt und Deckel von Aubrey Beardsley. Autorisierte deutsche Ausgabe von Margarete Mauthner. New York: Viking, 1928. Hardcover. Third printing. Illustrated by Aubrey Beardsley. Front fly neatly clipped else very fine in very fine, patterned glassine dustwrapper. A lovely copy.